The star has been shooting the sixth installment of the spy series in Abu Dhabi. Tom Cruise has thanked “the amazing people of Abu Dhabi” after wrapping up the shoot of his latest film, Mission: Impossible – Fallout. Earlier this week the Abu Dhabi Film Commission posted a photo of the actor to its Instagram account, confirming that the sixth installment of the spy series was being filmed in the UAE capital. On Wednesday, Cruise tweeted that the shoot was complete. The Hollywood star has been credited as the first actor to bring a major film shoot to the UAE. 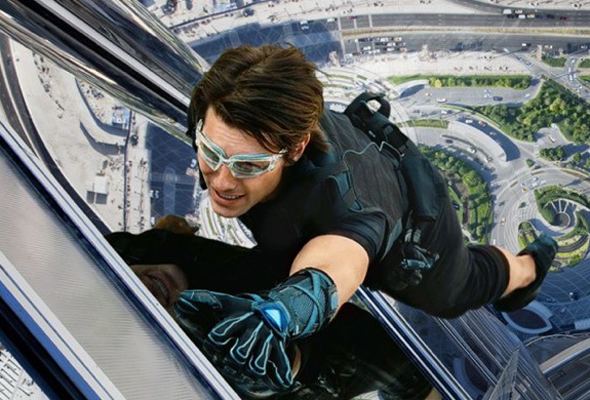 His 2011 blockbuster Mission: Impossible – Ghost Protocol was filmed in Dubai, with scenes in the desert, and an iconic scene in which Cruise scales the Burj Khalifa. While in the UAE for his latest shoot, Cruise met with top media executive Ahmad Al Shaikh. According to Al Shaikh, the pair discussed “the best ways of making the UAE a hotspot and a magnet for global filmmaking”. Written, directed and produced by Christopher McQuarrie, Mission: Impossible – Fallout also stars Rebecca Ferguson, Ving Rhames, Simon Pegg, Michelle Monaghan, Alec Baldwin and Sean Harris. The film is scheduled for release in late July.